My wife and I are midway through finding the answer to the question posed by the headline. This is an increasingly common concern for suburban Boomers; and there are underlying social and economic factors gone largely unnoticed by mainstream media and housing experts. We are ‘likely voters,’ for example, who will never spend a winter in a Southern condo, who don’t want a homeowner association dictating what vegetables we can grow, where, and who are looking far past what a real estate agent will advise be done with an eye to fixing and flipping. In other words, it’s not a TV show house, it’s our home; and improved looks need to go hand in hand with making it a healthy, efficient place to live, in a great school district. We also wanted some buffers for dealing with increasingly severe weather extremes. This August, then, building permit and final drawings in hand, we set out to make our 40-year old suburban tract house – originally a cheaply built 4-bedroom model on a half acre, with tiny bathrooms and closets – into an energy efficient dwelling, as environmentally secure as it is stylish. Hopefully, our many lessons learned from planning, designing, building, and decorating will be of interest, translated into a series of blog posts here. Take your time and actively consider getting an architect. Only a small fraction of all home upgrade projects in America involve an architect. You commonly see reports that the portion is ‘10% or less.’ Who knows where that number comes from? Whatever. Our project was extensive; so I wanted an architect who not only had a track record with residential upgrades, but who also was a good meeting facilitator – a consensus builder who could suggest alternatives. Cheap labor poses hidden environmental risk. Being in a Philadelphia suburb, many home upgrades hereabout are done with ‘Lancaster Amish’ contractors — skipping the architect entirely. There are tradeoffs with this approach, however, as Amish crews have to hire a driver to get them to and from the job site; and they may lack experience with things critical to both the schedule and the environment. And, I expect they don’t get green design at all. (Amish farms are the wost at leaving exposed soil on the hillside and cow manure at the stream side – so why would I expect otherwise?) I don’t have it out for the Amish. They do great, high quality work; but, any project premised on the cheapest possible labor carries the risk that environmental tradeoffs will go unseen. Why this is an immensely important question for climate. Christopher Sellers, on the opinion page in today’s NYT wrote a piece titled “How Green Was My Lawn” in which he points out that the environmental movement began in the suburbs and must as a practical matter return there – where increasing numbers reside in an old housing stock. “Today, however, climate change, perhaps the most important environmental issue of our time, rarely polls among voters’ top five concerns. One reason may be that its patently global character has enervated support at environmentalism’s suburban grass roots. But it doesn’t help that blanket condemnation of suburbs as hopelessly dependent on fossil fuels comes all too easily. Many of today’s environmental leaders have thus steered their imaginations and energies away not just from where their own movement was born, but from where a still-growing majority of Americans actually live. Everyone has heard that old carpenter’s saw ‘measure twice, cut once.’ For a large scale home upgrade, and especially with a substantial addition, I’d precede that one with ‘take your time planning and designing and discussing. 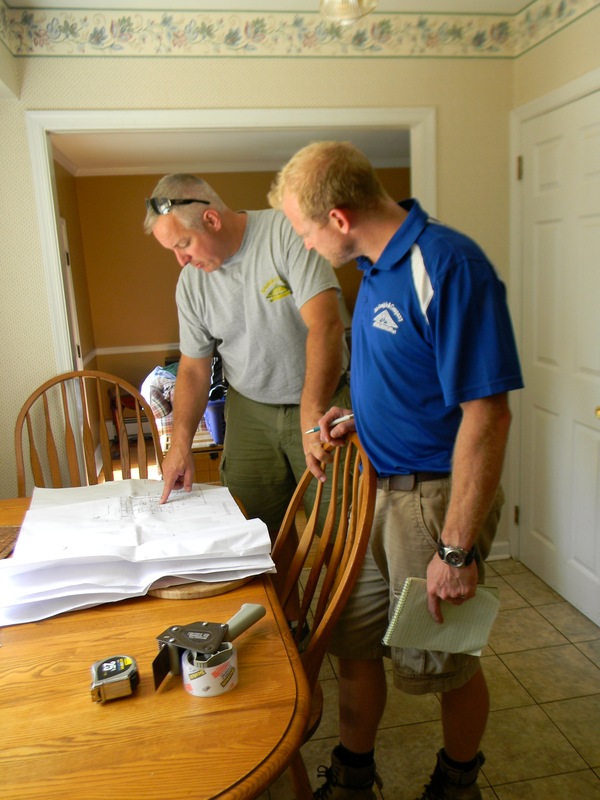 Before you hire a contractor, at least interview a few architects and get your surveying done by an engineering firm that understands the latest in storm water management.’ Hundred year storms happen now on a quarterly basis. You want to figure this out not just to ‘get a permit,’ but also to protect your family and home. The woman architect we chose to work with understood and spoke about style and decor the same way my wife did – something that made the planning and material selections go a lot faster for both of us. This makes a huge difference once the project gets underway. If style is important to your partner, guys, hear me on this. ← Boomers are a big deal, and the New York Times IS ON IT!